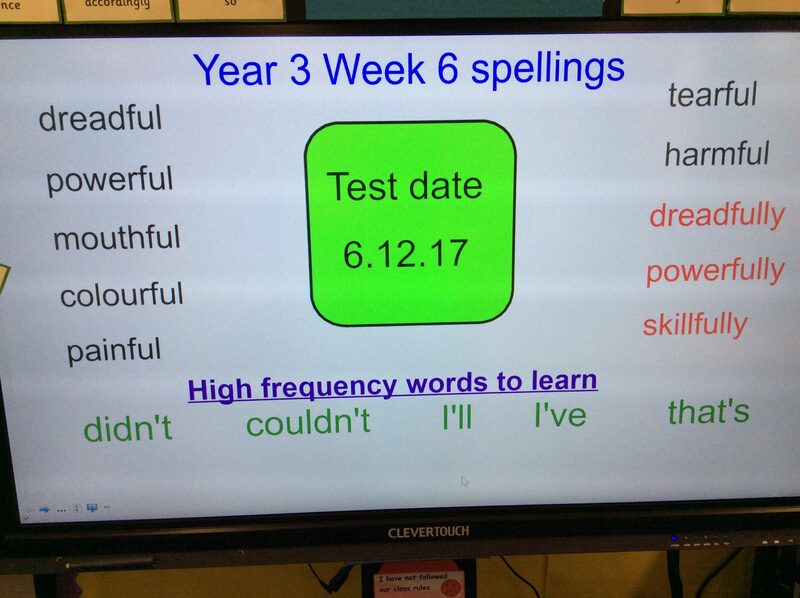 You will also be tested on 5 words from the year 3 and 4 list. Keep practising. This entry was posted in Year 5 and tagged English, Homework on December 3, 2017 by Sandford Hill. Remember to practise your Spellings and send in a spelling blog. The words of your story should be powerful, not dreadful and it should be skilfully written! This entry was posted in Year 3 and tagged English, Homework on November 29, 2017 by Sandford Hill. We have some more fantastic pieces of homework from our Year 6 children. Charlie has built his very own tank and put together a really informative poster that highlights some of the key facts about the war. Demi has created her very own memorial which combines her learning about the war with the recent Remembrance Day we’ve had. Some really effective imagery here. Abbi has built a bomb! However, she assures is that it is just a replica. Excellent attention to detail Abbi. Lucy Kelsey has created a charming Anderson shelter complete with washing line and vegetable plot. This entry was posted in Year6 and tagged History, Homework on November 27, 2017 by Sandford Hill. Yes nursery parents, this is a lesson just for you! All the nursery children have been working very hard over the last few weeks learning how to do disco dough. 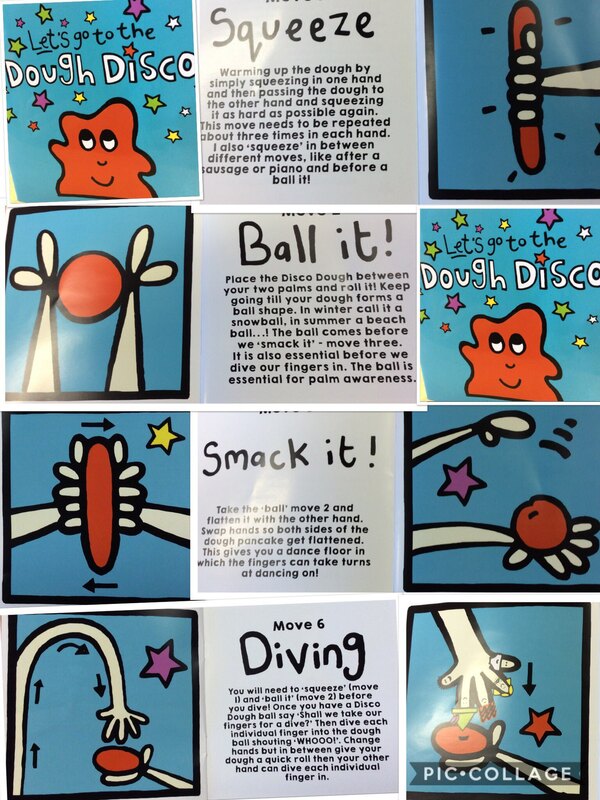 However some children have said “my mummy doesn’t know what disco dough is”, one child said “can you show my daddy”. So here it is, have a look and give it a go! We are sure you will love it as much as your children. We welcome your comments. This entry was posted in EYFS and tagged Homework on November 27, 2017 by Sandford Hill. A big, big thank you and well done for all of our fabulous flying machines in year 2. This entry was posted in Year 2 and tagged History, Homework on November 24, 2017 by MissGregory. 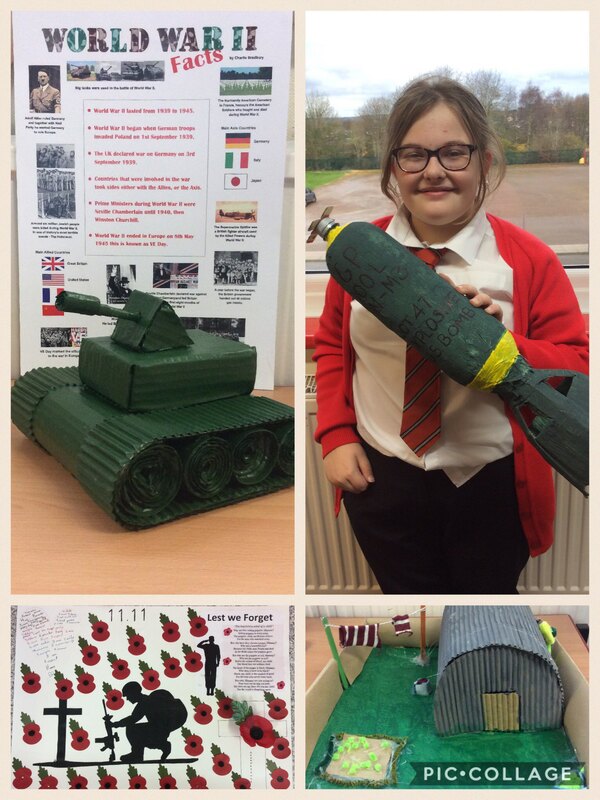 Here are some really fantastic homework projects from our excellent year 6 children. 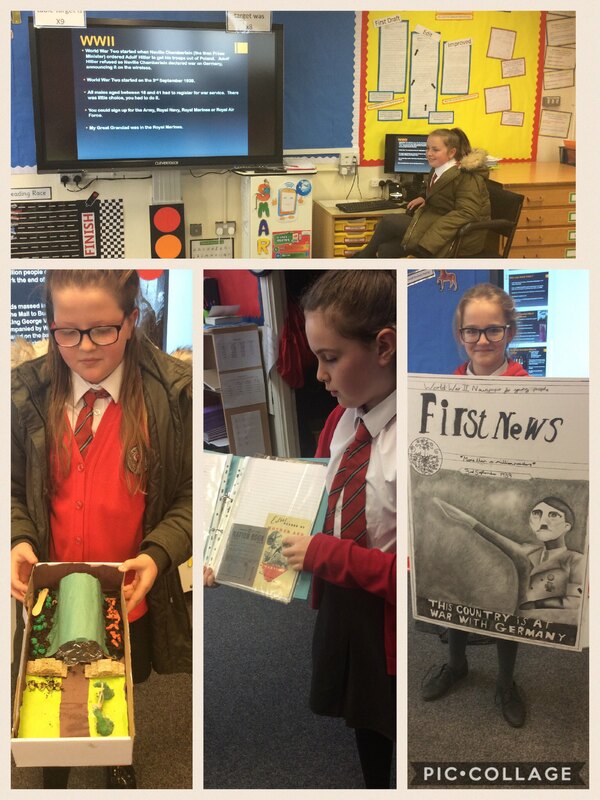 Lucy became the teacher as she showed her fantastic presentation on World War 2 including a section on her great grandad and his military service history as well as the many medals he had earned. Millie showed us her Anderson shelter complete with real soil and a fork for digging up home grown veg! Ruby brought in a variety of historical items including a baggage tag, a ration book from 1929, a kitkat wrapper and a diary entry from 1938 all with written entries explaining their significance. Macy helped us ‘read all about it’ with this stunning front page of a newspaper, sketched then shaded with charcoal. Impressive work! Well done everyone! It’s lovely to see the children putting so much time and effort into their projects. This entry was posted in Year6 and tagged History, Homework on November 15, 2017 by Sandford Hill. 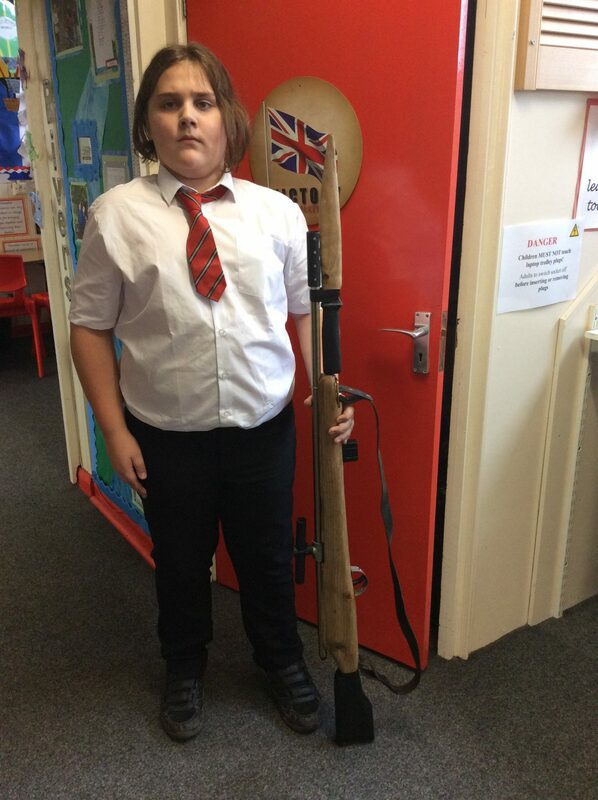 Gabriel, with the help of his dad, has made a replica German sniper rifle for his World War 2 homework. He says it took him and his dad between 2 and 3 weeks to complete. Excellent work Gabriel! Remember Year 6, the deadline for your homework on World War 2 is the 2nd of December. This entry was posted in Year6 and tagged History, Homework on November 6, 2017 by Sandford Hill. As part of their learning challenge over half term the children in Reception went on a number hunt to find numbers in the environment. Thank you to everybody who sent in a picture, we have thoroughly enjoyed looking at the numbers you found and in so many different places! Numbers really are everywhere. This entry was posted in EYFS and tagged Homework, Maths on November 5, 2017 by Sandford Hill. Once again the children in Year 3 have amazed me with their creativity and artistic talents when creating their Homework Projects. The children used many different ways to present their work, all of which were amazing. Thank you to all the adults who helped with these creations, your time and support is very much appreciated. This entry was posted in Year 3 and tagged History, Homework on February 13, 2017 by Sandford Hill. 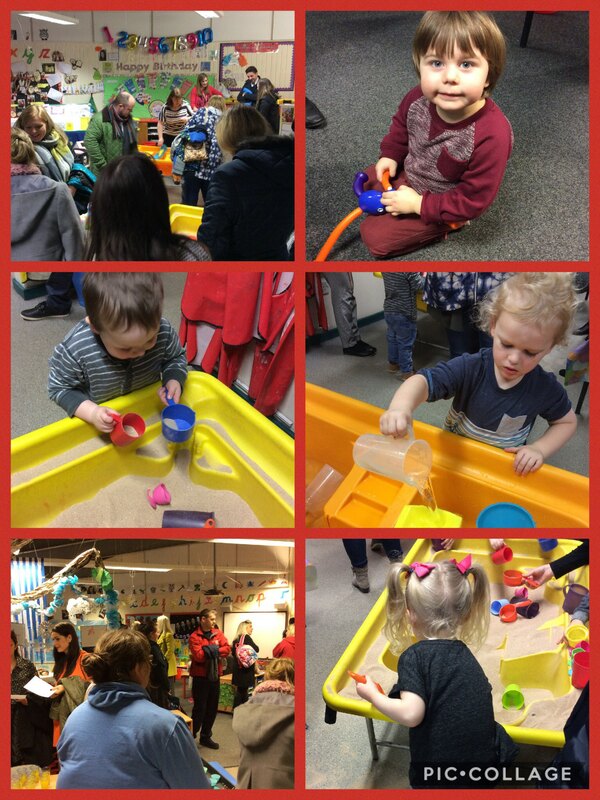 How lovely to see so many prospective parents tonight for our Nursery open evening. The children are having lots of fun exploring our Nursery. Thank you to all for coming and we look forward to seeing you in the future. This entry was posted in EYFS and tagged Homework on January 10, 2017 by Sandford Hill.